Detroit emergency manager Kevyn Orr, left in center of photo, with Michigan Gov. Rick Snyder. Snyder on Wednesday announced financial help for the city. Michigan's governor proposed Wednesday that the state provide up to $350 million to help Detroit exit bankruptcy and protect city pensions. "This is not a bailout of paying the debts directly of the city of Detroit. This is not a bailout of banks and other creditors," said Governor Rick Snyder, who was joined at a press conference by top lawmakers. "This is focused on helping reduce and mitigate the impact on retirees." In the wake of the city's bankruptcy, employees and retirees face the possibility of deep cuts in promised pension benefits and health care coverage. At the time of the filing in July, the city had about $11.5 billion in unsecured liabilities. 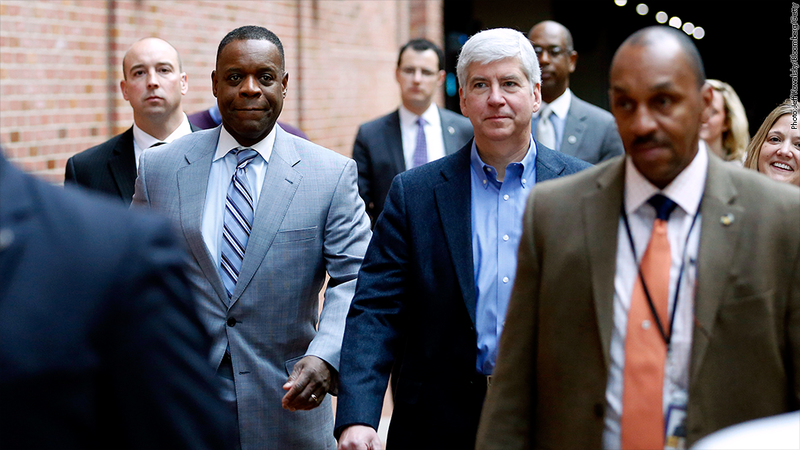 Emergency Manager Kevyn Orr, who was appointed by Snyder to oversee the city's finances, has proposed using the bankruptcy process to shed more than $9 billion of that debt. The proposed assistance, which will require legislative approval, would have a number of conditions. It hinges on a successful settlement of the Detroit bankruptcy between the city, state, unions, employees and retirees. Snyder also said the deal would require beefed up independent financial oversight of the city's pension funds, which have previously been dogged by bad investments. The proposed settlement offer builds on $330 million in private assistance that has been offered to protect worker pensions as well as city-owned art. Last week, chief mediator Gerald Rosen, a federal judge, announced that a group of private foundations had offered a combined $330 million to the Detroit Institute of Arts to buy all of the museum's artwork. The terms of the foundations' deal, which has yet to be approved, would allow all of the art to remain in the museum, while the $330 million would be put toward the underfunded pensions. Detroit's creditors have been pressuring the city to sell the DIA's art, which has been appraised at between $452 million to $866 million, in order to help pay the city's bills. The proposed help is good news for the city's employees and retirees, providing additional funding for the pension plans. But it won't close the entire funding gap, which Orr has estimated at more than $3 billion. On Wednesday, Orr lauded the proposed assistance from the state and private donors. He said the money "will go far in helping reach a timely and positive resolution of the city's financial emergency."